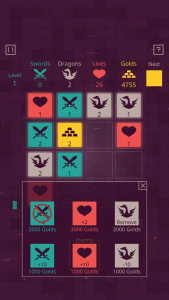 Dungeon Tiles is a strategic puzzle game with minimalism and RPG elements. Please download presskit(screenshots, icon, logo, cover art and press release document in a zip file [1.8MB]). 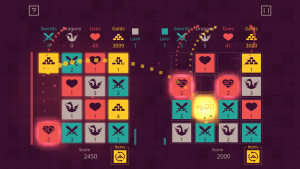 Dungeon Tiles is $25,000 Grand Prize winner of AppLovin’s Apple TV App Challenge. June 29, 2016, Nagoya-based developer Iyoda will release Dungeon Tiles for iOS and tvOS. 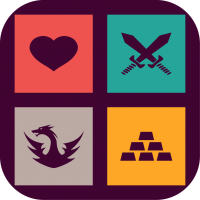 Dungeon Tiles is a strategic puzzle game with minimalism and RPG elements in which players swipe the screen to collect swords, dragons, lives, and gold. What made Dungeon Tiles stand out from the crowd and take the top prize? 1.“The graphics were great. I thought the way the app was designed really lends itself to a TV screen. 2.The gameplay is deceptively simple. You can start with a pretty simple game and it gets really challenging really fast. 3.Player vs. player mode is awesome. I love games where you have a choice to either improve your position, worsen position of your enemy or maybe improve enemy’s position. AppLovin’s tvOS Contest winner: A sensation in Japan! winner of AppLovin’s Apple TV App Challenge! Swipe the screen to move all tiles in the arena in the same direction. Combine tiles of the same color to score points. 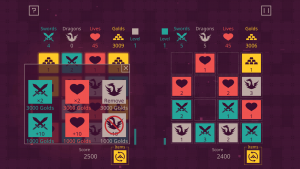 After each swipe, the total value of the combined tiles is added to a cumulative total for swords, dragons, lives, and gold displayed at the top of the screen and a battle begins. 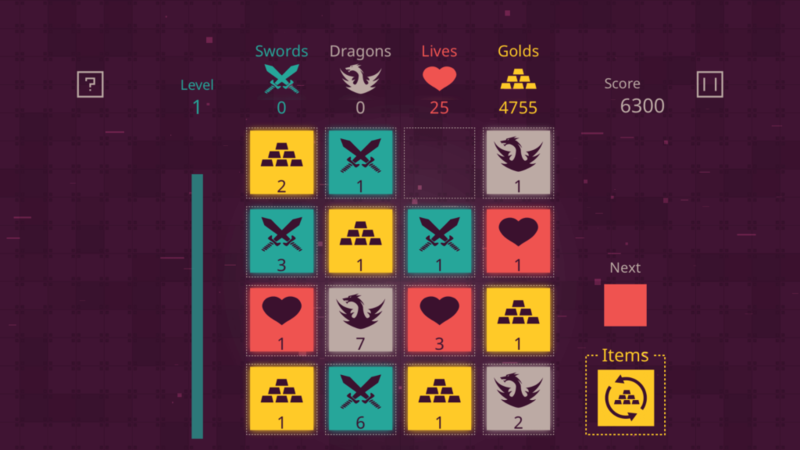 In the battle, swords reduce the “dragons” score and dragons reduce the “lives” score. The “swords” score decreases by the value used to attack the dragons. As dragons are slayed, the “experience” bar rises, and when it reaches the top the player improves his/her level. 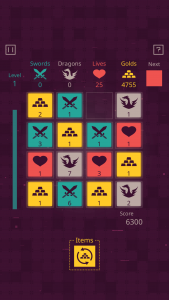 The game ends when no lives remain or the arena is full and no more tiles can be moved. When three or more of the same tile are combined, the tiles disappear. The gold collected during play can be exchanged for items. However, each item can only be used once. A player compete with AI(Computer). 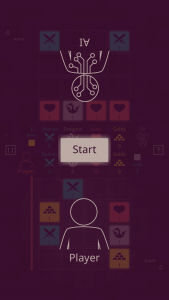 If it’s hard to recognize AI’s tiles, you can rotate all AI’s tiles in the pause menu. 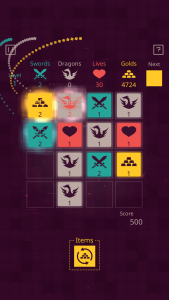 When a player swipes the screen, all of his/her tiles and all of his/her opponents tiles move in the direction swiped. 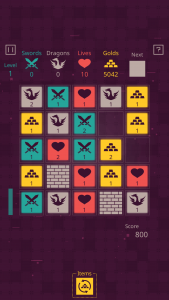 Players can disturb their opponent’s play by moving the opponent’s tiles in the same direction as their own. 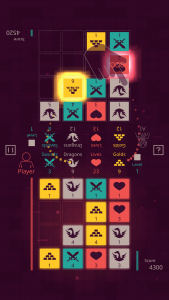 When three or more sword tiles are combined, one dragon tile is sent over to the opponent’s arena: this tactic can be used to alter the layout of the opponent’s arena and disturb his/her play. The game also provides a kind of math training since quick calculation skills are needed in order to obtain a high score. 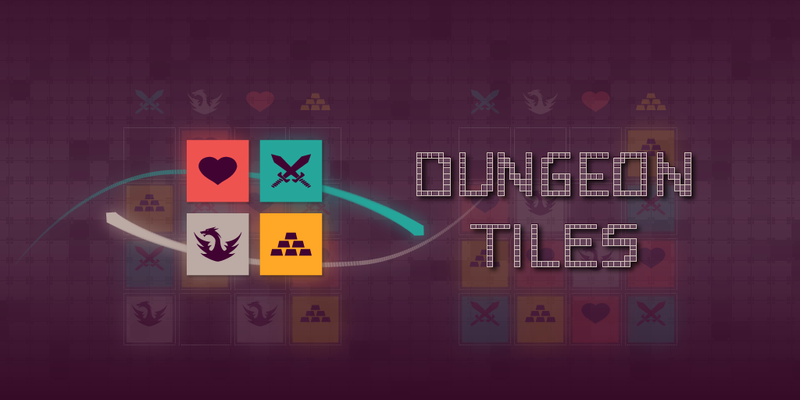 Dungeon Tiles for Apple TV supports MFi-based controller. 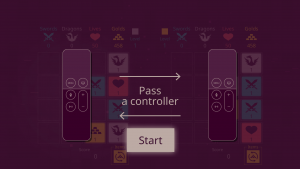 When players play two players mode, they can use Siri Remote Controller and MFi-based controller. You can play it with a Siri Remote Controller.